Here is a bit of magical realism for a sunny day. After the funeral, we went back to the house where she had always lived. There had only been two other people at the boneyard. Apparently the cousin of my father, and her husband. I’d never met her. My father and she had spent a lot of time together as children, but lost touch as adults. I couldn’t stop looking at the ears of the woman, like Ernst Blofeld she had no lobes. She had her hair cropped short. I remarked to my sister that if I lacked earlobes I would grow my hair long. We ate sandwiches, and drank tea, which tasted as if the milk was off. While they talked about the old days and how they would keep in touch, my sister and I sat in the kitchen drinking granny’s sickly-strong, home-made wine. Jennifer is single and on somewhat of a downer about it, as I was for a long time before Remy and me got together. I think there is something in this family, some inherited deficit of emotional capacity that makes it difficult for us to sustain relationships. I recall one instance of my father hugging me when I was about six, and I think I only recall it because it was so awkward and so rare. I have suggested to Jen that she go on the internet, as unlike me, she has not been lucky enough to fall for a work colleague. We all dealt with the loss in different ways. Or not. None of us cried at the funeral. They said the Lord’s Prayer. I was angry about that as to my knowledge my grandmother had no beliefs, or maybe I am projecting my own convictions (or lack of them) onto her. The funeral director said that when he was doing the research for the eulogy, (some research, managed to get my grandfather’s name wrong, though it was written on the headstone we were standing in front of,) he had discovered that in a recent letter to a friend, my grandmother had confided that she didn’t think her husband, my grandfather that I never met, who died before I was born, though whom I once had a ghostly experience of, wouldn’t recognise her when she got to heaven. Maybe she was religious after all. Remy says that people get more conservative as they get older, perhaps they get more religious too. As the final judgment day approaches, maybe those that sat on the fence before start to reconsider the possibility that there might be something more. Or maybe it’s just the hopeful denial of their ending. When I was little I used to spend a lot of my time at my granny’s. It’s not mentioned ever, but I think my mother suffered some depression when my sister was born, and for a couple of years I spent more time at granny’s than at home. I was an arty, daydreaming child. When granny would have her lunchtime nap, I would be set some creative challenge to show her when she awoke. One time I made my own aviary in the back room using pictures copied from a Ladybird compendium of British birds. One of my favourite games was to make a spider’s web of knitting wool under the back room table, whilst she dozed in her armchair in the front room. I’m not so sure untangling the multicoloured yarns was her favourite game. One day I made a swan out of silver foil. She kept that swan for 30 years. It sat on a shelf in the kitchen, occasionally being dunked into some soapy water to get the grime off. I had wanted to put that swan into the earth with her. I made it for her and she had kept it all those years. Now an orphan and having strange thoughts, my father said he was keeping it and was going to put it into a display case. I was angry about that at the funeral, but kept quiet. Remy says I shouldn’t bottle things up, but I’m British. I bottle things up. He is half-French. I have tried to explain that makes it easier for him, but he just does a little shrug. I think sometimes he enjoys playing up to the Gallic stereotype. He had a work thing the day of the funeral, couldn’t get away. I can only remember once ever crying in public. It was at a memorial service for the people killed on the bus bomb at Tavistock Square. I had only just started working at the university when that happened, and it was a couple of streets over from my office, but we heard the explosion. That was the first time I spoke to Remy. We were all herded into the basement where the students’ union was, pale-faced and frightened, drinking tea and watching Sky News. Whilst London stood still, frozen by a fear not seen since the days of the IRA, I was in the students’ union, drinking tea and trying to get off with a tall, slightly geeky looking half-French lecturer of Philosophy. One year after they held a minute’s silence in Tavistock Square. I held Remy’s hand. I cried. We got married eighteen months after. We had our honeymoon in Bordeaux, where his father comes from. The first couple of years we went back to France for our anniversary, but we haven’t had the opportunity to go this year, what with Remy being made department head. When I was a little girl, I used to dress up in my granny’s wedding dress. I didn’t wear her dress at my wedding. Somewhere along the years it had got wet and rotted. It was six months later when they were finally clearing the house that they found a box marked ‘Laura’s bottom drawer’. Back in London, I asked my mother to describe the contents to me. Inside it was a cheap stainless steel set of cutlery with red handles (the type you might get free from a petrol station if you saved up tokens,) a set of mugs, and bed linen. My mother said she’d thrown the linen away, it was yellow with nicotine. She said she thought I wouldn’t want the other bits either, they were very old fashioned and not the sort of style me and Remy like. I said to take them to a charity shop then. I didn’t understand why my granny hadn’t given them to me. Or perhaps having seen the wedding presents, having seen the way we live now in our perfect white box, I did understand why she hadn’t. She was too proud to collect her pension. The house had been paid off and she was able to live off some investments. Nothing amazing. Just enough to get by on. And a savings account to pay her funeral costs out of. My parents are thinking of selling the house, her house, they were going to rent it out, but I don’t think my dad wants to see anyone else living there. They had to gut it, it hadn’t been touched since it was newly built. Everything went into a skip. The contents of her life. You couldn’t give them away. I hadn’t thought of her as poor, as she was always so neatly turned out. But the clothes were always the same, patched and mended invisibly. It didn’t occur to 11-year old me we were all a bit poor, with my smart school uniform paid for by my Government Assisted Place. It was one of the times when she was asleep in the front room on her afternoon nap that I encountered my grandfather. I had been looking through the dressing table, I was allowed to put her jewellery on but not to try on makeup. I liked to sit under the dressing table, draped in pearls (not real, I bit them to see,) pretending it was a ship’s cabin and I had been kidnapped by pirates on the high sea. Suddenly I was filled with an incredible sense of sadness and drawn into the room where my grandfather used to have his office, now a spare bedroom. I smelt pipe smoke, I felt someone there, but I wasn’t scared. I couldn’t stop the tears running as I looked out the window over the playing fields where they had walked their dog, Bertie, 30 years earlier. 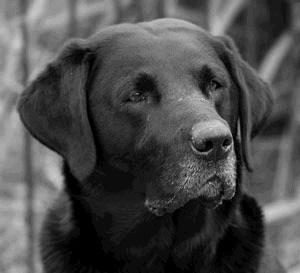 I thought I saw a black lab in the distance, bounding up to a man smoking a cigar. He looked at me and waved. I wiped my eyes with a sleeve and when I looked up the dog and the man were gone. There was a box in the back room containing every single card we had ever sent her. My father broke down for the first time when he found the cards he had made his mother as a child. There were cards from me and Jen too. My scrawling childish handwriting being replaced by neatly typed letters when I had got my first typewriter, then the word processed letters I had sent her when I went to university, their number decreasing as I spent longer away. Jen doesn’t like Remy. His not coming to the funeral didn’t help matters. She says there is something she doesn’t trust about him. She’d had a few drinks, she wasn’t thinking straight, she said he’d made a play for her at our wedding. I told her she must have mistaken his European manner. When I got back to London, I decided to talk to him about having a baby. I want to call her Lydia after my granny. I told Remy we were not getting any younger and if we were going to have children that we better start thinking seriously about it. He gave me one of those shrugs and kissed me. But a proper kiss, like he hasn’t given me in a while. I plan to start taking folic acid immediately. We used to go on holidays to Weston-Super-Mare. Just me and my granny. There are pictures of me wearing flared jeans and a stripy top sitting on the sand in front of the paddling pool. I think they’ve knocked that pool down now. We would go and sit on the sanddunes all day, with a packed lunch. I would wander off to the tunnels in the gorse between the dunes and the golf course. I would spend hours sliding down the channels probably created by rabbits and other furry things. Then we would go to the ice-cream stand and I would have a 99 flake. My sister has decided to steal my life. Jennifer is pregnant by a man she used to go out with when she was at college. They broke up at least sixteen years ago, but she tracked him down on the internet. Had the internet not existed she wouldn’t even have thought of doing something like that, but the internet allows you to go back and rake things up. As far as I’m aware she didn’t even particularly like him when she used to go out with him. My father is delighted, Jennifer has moved into my grandmother’s house and she and her new-old boyfriend have started an extensive program of modernisation to get it ready for the baby. Didn’t it occur to them I might like to live there? A colleague has gone off longterm sick and it’s been ever so busy at work. I haven’t been sleeping well. Remy has been working long hours. Sometimes he doesn’t get in till after I’ve gone to bed and then he’ll sleep on the futon in the spare room. One of those nights when he hadn’t come in I had a dream. I was standing at the edge of the playing fields. I saw a black labrador in the distance, bounding up to a couple arm-in-arm. A neatly-dressed woman and a man smoking a cigar. They waved at me and I felt so happy to see them together that I started crying. I wiped my eyes with my sleeve and when I looked up they were gone. I woke up and I could smell the faint smell of Apple Blossom by Helena Rubenstein. Remy had come in and was sitting on the side of the bed. ‘I’ve let work get on top of me, I’m so sorry I couldn’t go with you to the funeral,’ he said, ‘I’ve been thinking about us, about what you said, you’re right… we should call her Lydia,’ he whispered and kissed my forehead. (c) Sam Hall, 2011. This is a story which may be part of a set of stories about a family. Zach Seklof groped for the snooze button on the uni-wand by his bed like a newly born kitten. Theoretically sentient yet clinically unable, as yet, to open his eyes. That holo-alarm had seemed like such a hoot when Flo had given it to him for Christmas but in the elemental darkness of a January morn after a night on the Fullers having Tim Curry doing a virtual grind in your direction is none too pretty. Flo remained oblivious. Flo often did. It’s a talent. “Oh Merde!” His mood was not improved by the discovery that he had invoked that 10 minute escape clause more times than he had thought. Better call in and make some excuses in advance. “Oh hi Chris, running a bit late today….” opened Seklof weakly. Zach Lycra’d up and popped open a tin of “Willesden Green”. What he would have given for the bacon and eggs of his youth. Of course since the food shortages of the ‘20s BritGov had resorted to doling out tins of a pate like substance named simply after its colour and place of manufacture. Most people reckoned it tasted of, well, Willesden. He pushed off and joined the insectoid throng of London Road swarming towards the Spectrum power mill. Chris was there at his position already as Zach shuffled into the dynamo room, Bulbous and leering like a slave ship drummer. 11 other bodies were already toiling away, one position stood idle. It had his name on it, blinking red on the LCD screen facing him. Chris sniggered. It was fear more than duty that carried him onto the bike. Slowly gathering pace his limbs were crying out already. 67. Another eight years before they’d let him stop. He had not noticed that his legs were not moving until they hauled him away, tears but no weeping as he briefly recalled another life. Flo sat alone in the darkness, feebly wafting the uni-wand at the silent EntCube. An extract from a play about a group of friends in the ten years leading up to the Millennium. 1989. One year before the accident: 3.26AM. A bedroom in a house-share. Goth posters on the wall; a single bed. The sound of fairground music, almost too quiet to hear, introduces BEATIE. Beatie: early 20s. Odd Scottish/Cockney accent. Long dreadlocks. Piercings. Many tattoos. Fleecy jogging pants, black lycra sleeveless top. Cross-legged on the bed, nursing a blanket. A small rotating table-top lamp, projecting a swirl of stars and planets on the wall. *Beatie and Edie are not aware of each other to start with, but become more attuned to each other as the scene moves on. I haven’t told my Ma I’ve dropped out yet… I can’t tell her that sort of thing, we’re not that sort of family. Lights up on a kitchen. Pine, warm. EDIE: late 30s, vivacious, Scottish. She is wearing a baggy man’s jumper over a silk nightdress, her hands are floury. Left me behind… My baby, my babies, are leaving…have left me. I’m alone. Ted not-withstanding. It’s all changing. The world’s changing, challenging, there’s something in the air, some sort of tension, some buzz. It’s like it was at the end of the ‘60s. There was this buzz then. It’s the same now. The Wall coming tumbling down. A sea change. A new Millennium on the way. Nothing to stop it. But some days I feel like… Time passes just like that and then you’re left with nothing if you’re not careful. BEATIE: …Went up to see the bonfireworks. Colours brighter; a layer of water between my eyes and the world. You need to be outside when you’re tripping. They were the brightest bonfireworks I’ve ever seen in my life. EDIE: …I worry about her, them, but her more so than him. You do with girls don’t you? When she came back that evening with her first tattoo, I nearly had kittens. Him, I would have expected it of, but not her. It looked so ugly. She had made her beautiful, soft skin ugly. She was only 15, she had lied to the man in the tattoo parlour… Little minx. Who’d have ever thought that beautiful little child with the blonde kiss curls would turn into the tattooed… tattooing lady? I’m thinking of getting her to do one on me. Maybe her name in a heart. Just (exaggerates French) ‘tres petite’, on my arm on the top. Nanna would be spinning in her grave. (c) Sam Hall, 2011, An extract from ‘Wet Dreams’, a play. I dreamt about him again last night. I find I’m always dreaming about him these days. Or is it a memory? Or is it something to come or something that will never come? Them. Him and his little family this time. Always the same sort of thing, always the same way, can’t recognise who he is. I don’t know who he is, I don’t know who she is, I don’t know who the baby is. Just can’t see who any of them are. Are they mine? Am I him? Am I her? He was walking down a familiar street, in my dream, pushing a blue striped baby buggy, with a black and silver rucksack hanging on the back. He was striding along, a tall man with dark hair and the hint of a beard shadowed on his face, wearing a navy jumper and those grey elephant cords. He always wears those. So many things about the dream are clear, like a thing that has happened over and over so many times that you remember it in your sleep, and then you wake up and you are confused and don’t know where you are. He paused for a minute to look at the sculpture of the lady in the fountain outside the library. He felt the memory of them. Two giggling girls, one bottle of Fairy liquid, one overflowing fountain. The baby gurgled happily as it watched the jets of water and the man (he had kind eyes – he always has kind eyes) leaned over and tickled the baby’s chin. He adjusted the baby’s loose blanket and wheeled the buggy on. ‘Not long now,’ said the man, I can hear his voice but I cannot hear what he sounds like, parking the buggy and sitting on the bench by the bus stop. He got a bottle of juice out of the rucksack and gave it to the child, who started sucking contentedly, letting it slip from his grasp a couple of times so his father would have to replace it. A bus pulled up at the stop and the man looked eagerly looked at the door. An old lady got off, followed by an impatient pair of young lads, it didn’t look as if she had caught this one. But then she was there. The mother. Couldn’t see what she looks like either. I think she must be nice. They seem pleased to see her. They seem to love her. She came over to him and kissed them. And then the dream ended. It’s like I know them. They have been visiting my dreams now for months or years even. Who are they? Who are they? Will I ever know? Will I ever meet them? Am I in the dream? I am them but I am not them. I don’t think so, I don’t think so, no. It’s like they come to me and want to tell me their story, they want me to tell their story. And now I have started forgetting what my story is and what their story is and how it all fits together. If it ever fitted together. I dread their nightly visits but I long for them. I love them (all of them) and I hate them, for keeping me in the dark but keeping my eyes open. I am afraid of the day when I forget me and only remember them. It’s happening already. I found the pillow was wet when I dreamt I woke up. (c) Sam Hall, 2011, an extract from my forthcoming novel, tentatively titled Groupie no. 52. The utterance that strikes terror into the heart of all temporary staff in customer service situations. This is mainly owing to the fact that there are, from my point of view, a number of answers to that question, none of which are strictly true. For the purposes of descriptive and geographical accuracy, I am indeed working and I am also here. That said, should I answer yes to his question the chain of events that follows will almost certainly result in catastrophic damage to the ontological security of said customer. The reason for this is that he will then reasonably expect me to be able to tell him about the products I am stacking and where others may be found. We would then be on the road to insanity as I would then be forced to admit that firstly, while I may be working I have no idea what I am doing. My second culpable admission will be, that while I am undoubtedly here, I have no real sense of where here actually is. The problem with this is, that to say no would be palpably absurd. I am without doubt here so far as the customer is concerned as he can see me. Also, the satanic pact that all temporary staff make with their patrons does not allow for any admission of professional confusion. Confusion is the job of the customer and we are here to unburden them of it. It is indeed a little known fact that the scanners on store entrances serve a double purpose. Quite apart from the detection of light fingered clientèle, it is rumoured by many in the service sector that they somehow lobotomise the individual in question back to the infantile state that is known as being a customer. Hence the face of competency must be maintained at all times lest they become more nervous than is good for them. If the above passage is beginning to make the reader’s head hurt, try actually living it on a daily basis. (c) Barry Fentiman, 2011, an extract from my forthcoming novel The Odd Job Man.